British niche brand Miller Harris will launch Le Pamplemousse in April. The new limited edition fragrance was inspired by a walk through a grapefruit orchard near Marrakech. The notes include grapefruit, citrus, rhubarb, melon, orange blossom, sage, rosemary, vetiver, oak moss and Atlas cedar. 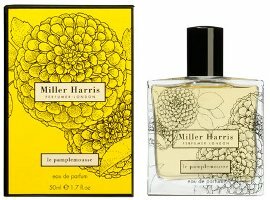 Miller Harris Le Pamplemousse will be available in 50 ml Eau de Parfum. I hope this is good. I LOVE grapefruit but have yet to find one that appeals to my nose once the top notes start to fade. I’m hoping that the vetiver, cedar and orange blossom will give this a bit of staying power. Can’t wait to smell it! I hope it’s good too. Grapefruit can be a difficult note. I like the description, but I am afraid it would be walking through a Moroccan garden full of cat pee to me. Ugh. I know exactly what you mean. Cats everywhere! Anyway, I like the notes in the fragrance. Grapefruit does sometimes work out that way! Does this have to do with skin chemistry or with the way one perceives the note? HAHAHAHA, everybody! Same problem for me; I long for a good grapefruit, but I have yet to find one that works for me beyond the first few minutes… My fear is this would be like walking through a Moroccan cat-hoarder’s garden WHILE drinking a glass of New Zealand Sauvignon Blanc. This sounds wonderful, and oddly enough, grapefruit works with my skin. I do wish that Miller Harris were in wider distribution in the U.S., though; I haven’t even tried the last one yet. I once read that grapefruit as a fragrance note is very difficult. I think it has something to do with the sulfurous component it contains. Some people will read the note as intended and others will read it as cat pee. I think it was Luca Turin in one of his books. That’s ironic as one of things I distinctly remember about Morocco is that there were cats everywhere! MUSC RAVENGER. I have found that and SSS’s WOOD VIOLET to be my favs right now but I must find some more scents like Ravenger. I love SEVEN VEILS, by Byredo. But I want something deeper. I want OW because everyone says its beautiful.